1000 applaud as Huckabee terms Israel "beacon of true freedom"; Israel's "Godfather on Wall St" Harvey Krueger honored. On Thursday evening, May 17th, over 1000 Christian and Jewish advocates for Israel gathered at the Crowne Plaza Hotel in midtown Manhattan to celebrate the Jewish State's re-birth at the 8th annual Jerusalem Banquet of the Eagles' Wings organization. Founded in 1994 by Dr. Robert Stearns, Eagles' Wings represents a conglomeration of Christian evangelical supporters of Israel and the Jewish nation. Based in Buffalo, New York and with chapters around the globe, the Eagles' Wings philosophy is predicated on their passionate belief in the Biblical axiom that "those who bless the Jewish people will be blessed, and those that curse them will be cursed." Attributing their heritage to the Jewish people, their website states that, "Christianity did not form in a vacuum. Our faith was generated from a consecrated place - Israel - and a chosen people - the Jews." Among those in attendance were such prominent Jewish personalities as Ido Aharoni, Consul General of Israel in New York, Rabbi Joseph Potasnik, executive vice-president of the New York Board of Rabbis, Jeffrey S. Wiesenfeld, a CUNY trustee and a one-time aid to former New York Governor George Pataki, Rabbi Shmuley Boteach, television talk-show personality and author, Ken Abramowitz, co-founder and Managing Partner of NGN Capital, LLC, Rabbi Yaakov Kermaier of the Fifth Avenue Synagogue, Helen Freedman, Executive Director of Americans For a Safe Israel (AFSI), Phil Blazer, founder of Jewish Life Television, Mort Klein, President of the Zionist Organization of America and Rabbi Gerald Meister, former advisor to the Foreign Ministry of Israel. FOX television talk show host and keynote speaker, former Arkansas Governor Mike Huckabee said, "Every time we win a friend for Israel, we win a friend for democracy, freedom and justice." As a former Baptist minister, Gov. 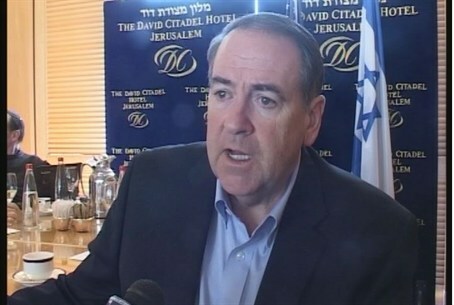 Huckabee recalled his past and his enduring relationship with Israel and the Jewish nation. "In 1973, a young man from Arkansas was brought to Israel by a friend because he couldn't afford to go on his own. That young man grew up to bring thousands to Israel, to speak about Israel, to support Israel with all his heart and soul, to take the reigns of leadership and find friends for Israel, and that young man was me," he said. "I grew up dirt poor and never ever thought I'd leave southern Arkansas but my destiny led me to the land of eternal faith." Governor Huckabee exalted Israel as a beacon of "true freedom" and said, "it is the only country in the Middle East that embodies this value." Having visited Yad VaShem (Israel's Holocaust memorial and museum) with his daughter and meticulously studied Holocaust history, Governor Huckabee exhorted his audience to be cognizant of ever-present Jew hatred. "Just remember that the cream of the crop in Germany, the best and the brightest, the intelligentsia and the culturally elite were the ones who executed the Holocaust and committed unspeakable atrocities." "Everything about our faith depends on the Jews. They are the apple of G-d's eye and our background is linked with theirs. You can be a Jew without having any connection to Christianity but you cannot be a Christian without having a connection and knowledge of Judaism. The Jews were around long before we were and it is their system of G-d given values and morals that we live by today." Being honored for his "remarkable accomplishments for Israel" at the Jerusalem Banquet was renowned philanthropist Harvey Krueger. Known as "Israel's Godfather on Wall Street", Mr. Krueger has been a leader in the banking and investment world for more than 50 years and has maintained a deep and abiding attachment to Israel since 1961. He was responsible for single-handedly opening the international capital markets to the government of Israel and Israel's varied corporations including Bank Leumi and Israel Discount Bank. He has served as Chairman of the Board of Governors of The Hebrew University of Jerusalem, President and Chairman of the American Friends of the Hebrew University and served as past Chairman of the Peres Center for Peace. Mr. Krueger is currently the Chairman of the Board of Governors of Tel Aviv University, Chairman of the Board of Reference for the Israel Experience College Scholarship program and a member of the Board of Directors of Bet Hatefutsot. "There was a time when I didn't even know where Israel was," said Mr. Krueger in a special video presentation. "While I was there for the first time, I had an epiphany. I realized that I was there looking for myself and I found him", he continued. Speaking of Israel's dramatic re-birth since 1948, Mr. Krueger said, "Israel started with nothing and used its intellect and integrity to contribute to the world. I want all people to understand Israel's importance to the world." Offering his accolades of the Eagles' Wings organization, Mr. Krueger said, "This is the first evangelical movement that I've supported. I consider Robert Stearns to be a friend and a mentor and I share his vision; his dreams are my dreams and I encourage everyone to support the valiant work he does on behalf of Israel." Of the Eagles' Wings Israel Experience program, Mr. Krueger said, "I was so incredibly impressed when I saw a non-Jewish woman organize Jewish students in their law school in support of Israel. I knew I had to help this nascent and vital program." In a voice reverberating with palpable emotion, Mr. Krueger said, "My greatest hope is that Israel survive and have peace. I think they are entitled to have peace." The focal point of the evening was the showcasing of the Eagles' Wings Israel Experience College Scholarship program in which all proceeds from the Jerusalem Banquet will go. Each summer, Eagles' Wings sponsors Christian student leaders from campuses across America and around the globe for a nearly month-long intensive training program in Israel. These "student ambassadors" explore the Jewish roots of their faith, gain a clear understanding of the Christian history of anti-Semitism and the Holocaust, while learning the principles of modern Zionism. When they return to their respective campuses, these young leaders commit themselves to organizing pro-Israel advocacy organizations; having learned how to articulate the current Palestinian situation along with acquiring the modalities in which to educate others on the agenda of radical Islam as pertaining to the Judeo-Christian world population. Among those speaking of their experiences while in Israel were Israel Experience alumni Hannah Johnson, a junior at Rutgers University, Ryan Mauro of the American Military University and Jing Wang of New York University. "It is our great honor tonight to announce the creation of the Harvey Krueger Israel Experience College Scholarship,' declared Eagles' Wings founder Robert Stearns to thunderous applause. "Harvey's friendship and exceptionally generous support means so very much to me and the impact that he will have on future generations of pro-Israel Christians is incalculable," added Mr. Stearns. In a short acceptance speech, Mr. Krueger said, "It is my privilege to be here with you tonight and I'm donating $50,000 to the Israel Experience Scholarship."